Cecilia Hillström Gallery is pleased to open the autumn season with two artists in a duo presentation; Gabriella Loeb and Martha Ossowska Persson. 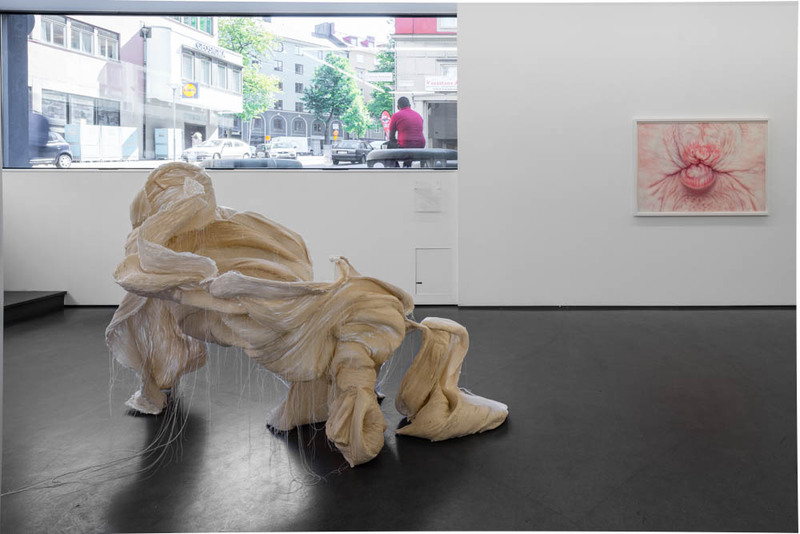 As the title of the exhibition implies, they share a sensibility in terms of closeness to the media of their choice – sculpture made of hardened fabric and large-scale watercolour painting. For both artists, questions arise from the act of doing. Loeb and Ossowska Persson let the painstaking process – involving a considerable amount of technical skill – guide their way to the final result. With a background in fashion, Gabriella Loeb abandoned the limitations and ideals of the fashion industry and became interested in the space outside the body. Her approach stems from an interdisciplinary approach where the know-how of haute couture, painting and dance is key. 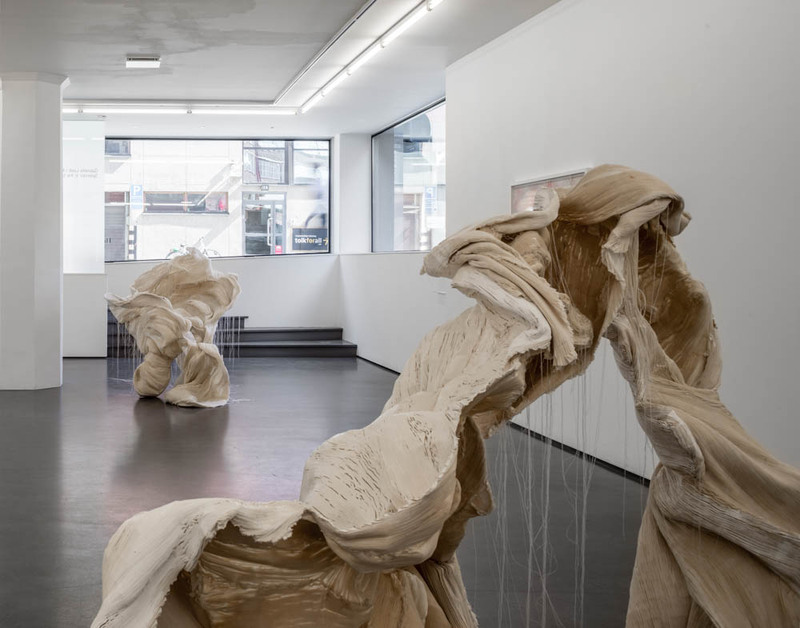 In her sculptures, Loeb uses texture to create structure, provoking sensation through an immeasurable number of folds. They are composed in toile, a lightweight canvas meant for both draping and painting on. ”The folds are made by thousands of hand sewn stitches that eat up the length of the fabric, slowing down the material from something quick and uncontrollable to a structure with an inner skeleton”, Loeb explains. Its resin coating freezes the textile in the midst of its performance, turning it from flesh to bone. 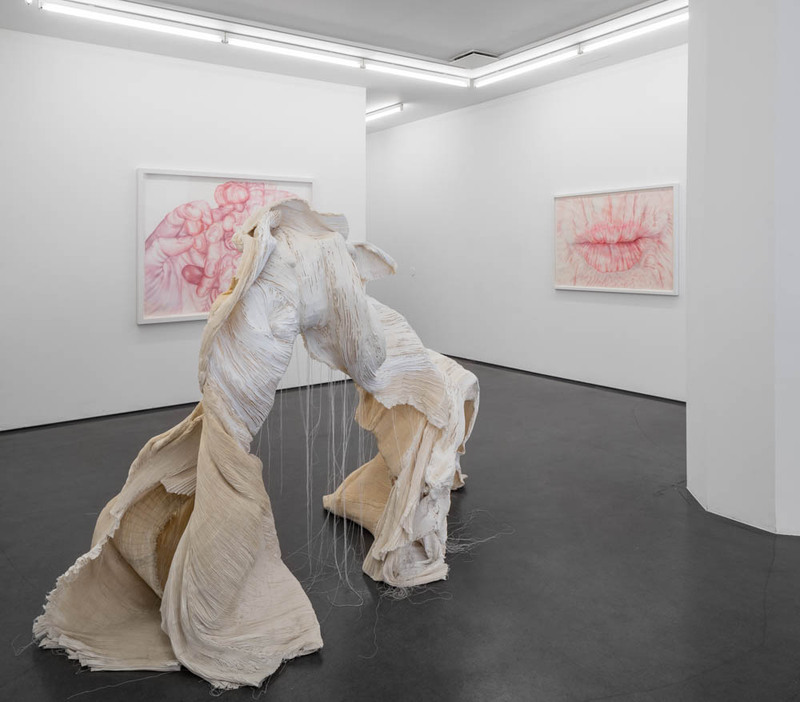 Gabriella Loeb’s interest in art from the Baroque era manifests itself in the way her sculptures affect the viewer, encouraging movement and interaction, at the same time expressing strength and vulnerability. Ossowska Persson works with a multilayered exploration of the human body and embedded human behaviors. 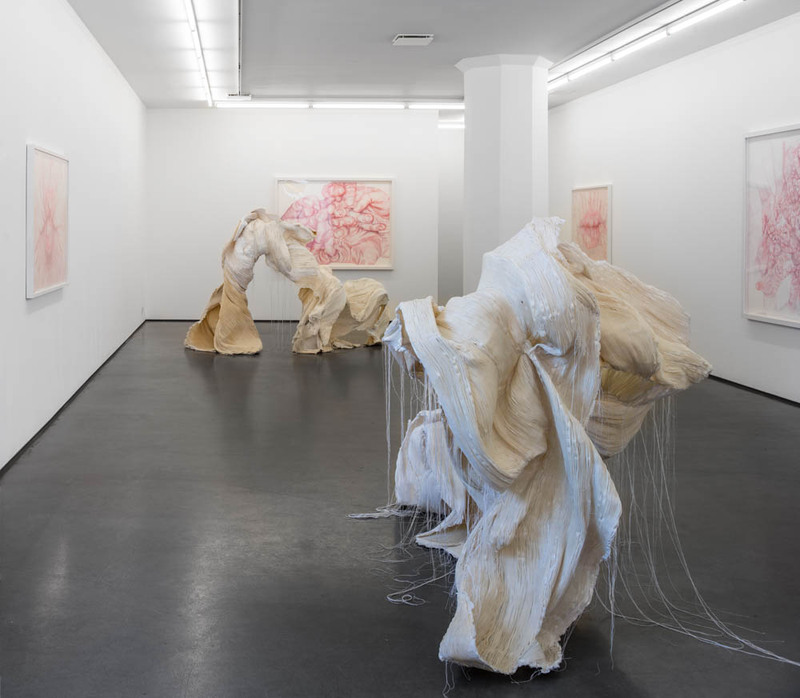 Her large-scale watercolour paintings capture bodies and limbs in moments of physical contact or tactile games that can be perceived as both an encounter and a threat. The close-up paintings of intertwined hands almost become abstract works, conveying the complex feelings residing in our bodies. The size of the paintings is important, challenging the artist conceptually as well as physically. For Martha Ossowska Persson, each brush stroke is risk-taking. In the constant struggle with the working material, the remnants of colour on the surface are the result of a process of coercion, skill and chance. Gabriella Loeb (b 1985 in Miami, USA) holds an MFA from Konstfack/University College of Arts, Crafts and Design (2014), and has also studied at Fashion Institute of Technology, New York. She received the Stavenowska Award in 2014 in connection with the Master Degree Show. Martha Ossowska Persson (b 1983 in Gothenburg) graduated from Valand Academy in 2014 (MFA), and has previously studied architecture at Chalmers University of Technology. She was awarded the Fredrik Roos Art Grant earlier this year, showing her works at Moderna Museet Malmö. Read more about exhibitions with Martha Ossowska Persson here.